Switzerland’s Autoneum, a world leader in the acoustic and thermal insulation for automotive applications, has signed a new exclusive license agreement with Ayegh Khodro Toos (AKT), an Iranian auto parts company that specializes in noise and vibration damping materials. Autoneum and AKT will establish a new production like at AKT’s facility in Mashhad in order to begin producing carpet systems and dashboard parts. The first parts will come off the production line in 2019. According to company materials, AKT employs 95 technicians and controls 75% of the market for automotive insulation. These parts will support the production of a new "SUV" by IKAP, the joint venture between Iran Khodro and Groupe PSA. The unnamed vehicle is most likely the Peugeot 3008, for which imports to Iran of complete vehicles will begin in early 2018. Commenting on the new agreement, Martin Hirzel, CEO of Autoneum, highlighted Iran’s potential as “a central automotive hub for the Middle East, Far East and the Caucasus region.” Hirzel sees “strong sales potential” as the company seeks to meet the needs of customers in this regional market. The new licensing agreement follows a common model in the Iranian auto parts industry, in which a foreign company brings technology and manufacturing specifications to a local partner, in order to supply the Iranian joint-ventures or CKD contract manufacturing agreements of the likes of PSA Groupe, Renault-Nissan, and Daimler. These parts are the lifeblood of a burgeoning Iranian automotive sector, which produced over 600,000 vehicles in the first half of 2017, registering 18% year-on-year growth. The Iranian Auto Parts Manufacturers Association (IAPMA) estimates that there are 1200 parts manufacturers in the country generating USD 8 billion in annual sales. 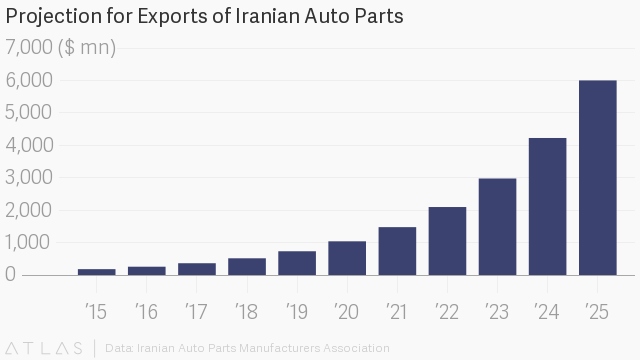 IAPMA ambitiously projects that Iranian auto parts market could generates sales of USD 32 billion by 2025. A major contributor of growth will be an expansion in exports, which are currently less than USD 200 million, but are expected to rise to USD 6 billion by 2025, a thirty-fold increase. Major Iranian auto parts manufacturers such as Ezam and Crouse manufacture under license for global players such as Bosch, Mahle, Mando, and Valeo. The new agreement between AKT and Autoneum shows the potential for smaller, specialist parts manufacturers to strike similar deals that improve the quality and sophistication of the parts available for the local market and for export.